This interactive photographic guide shall help you to identify higher plants from Africa (excluding Madagascar). It contains images of ferns and seed plants usually taken in the field. You can browse through a taxonomic hierarchy and / or search according to selected characters you observe on your plant. For more details, please have a look at this presentation of the database published in Taxon. A map and occurrence records can be accessed via GBIF. 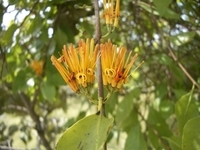 We welcome your contribution of instructive, well-determined plant images from Africa. Please contact us!